After the release of the Naked3 eye shadow palette last Christmas, we have been waiting for Urban Decay to stun us once again by releasing the Naked4. You guessed it, Urban Decay has done it again... this time, even more ingenious, and Limited Edition. 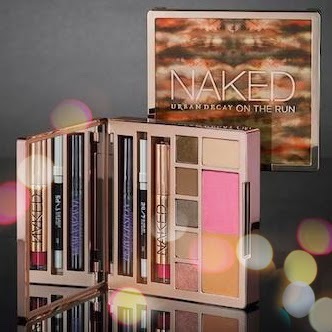 The Naked On The Run Palette has officially been released. Instead of 12 eye shadows, the On The Run palette consists of 6 BRAND NEW shadows, an extra large spot for an all-over neutral shadow, bronzer, and blush. Oh, and also a full-size Ultra Nourishing Lipgloss in a sleek new shade of red, a travel-sized Glide On Eye Pencil also in a new shade, and a travel-sized Perversion Mascara. It's literally for palette junkies on the run. For $54, you can buy it here.